So how do you ensure a great first impression, encourage engagement, and connect with potential customers? Read on for ten crucial blog design tips that can help you accomplish all of that and more. Subscribe forms come in many formats. You can place it above your content at the top of the page, feature it prominently in the sidebar, or have it slide in from the bottom of the screen as a user scrolls halfway down. No matter how you choose to set up your subscribe form, the most important part is simply having one. Subscribe forms are great for the marketer – you capture the email address of a potential customer, and great for the visitor – they receive regular updates containing compelling content. You’ve succeeded at the first step of inbound marketing, attracting visitors to your site, now it’s time to focus on conversion. Call to action buttons, also known as CTAs, can be images, text buttons or simple links that (surprise!) call a user to action. A CTA should connect to a landing page containing a form and an offer. Just like the subscribe form mentioned above, there are many ways to incorporate CTAs into your blog, but unlike subscribe forms, you should consider using all of them simultaneously. We recommend promoting one central offer and include a secondary offer as backup. Your main offer should directly relate to the content of the post. Add a simple in-line call to action text link after the first or second paragraph. Add a full width image CTA to the bottom of the article. If a visitor is interested enough to read the whole way through, then they might be interested enough to take that next step. Add a pop-up CTA that appears on exit intent. A pop-up CTA in HubSpot uses a call-to-action and offer form all in one and is something we’ve found a good bit of success using these for clients as well as our own site. For your secondary offer, add an image CTA to the top of your sidebar with a more generic offer. There are two ways you should incorporate social media into your blog. The first is with “Follow Me” icons. This is where you display one icon for every social platform where your company regularly posts. These icons link directly to your accounts, allowing visitors to follow you and browse your social content. The second type is called a “Share” module. These modules also display icons, but they are not linked to your account. When clicked, the icon will connect a user to their own social accounts on the platform of their choice, with a photo preview and snippet of your article. When the user shares the post it will show up on their feed for all of their friends and followers to see. One common practice is to vertically stack the share icons and fix them to the left side of the screen so they stay in view while scrolling the article. If you get a lot of traffic, consider adding a counter to show the number of times a post has been shared. As a B2B company, a visit to your website is usually the first interaction a potential customer will have with your business. One way to personalize the experience is with an “About the Author” section either in the sidebar or at the bottom of the article. Include a photo, bio, individual social icons, and a link to “all posts by this author.” This will allow interested readers to further engage with your content. Not only will this section personalize the experience, it can also establish credibility positioning your company as an authority in the industry. You’ve probably noticed that blog posts on popular websites have tens or even hundreds of comments per article. A comment section allows readers to give feedback about the material at hand and ask follow-up questions. It opens communication between you and the reader, and the readers to one another. Verify that notifications are set up, so that when a comment comes through you can reply in a timely manner. If a reader sees how attentive you are before they even become a customer, they will know they can count on you to be there for them long after the sale. Regardless of the blogging platform you use, there should be a way for you to assign specific topics to a post. Topic tags should be displayed in correlation with each article; place it within the content on the listing page and at the bottom or sidebar of your post pages. A list containing of all your topics should also be readily accessible on both listing and post pages. The standard way to present topics is by stacking them in the sidebar, though a mega-menu dropdown format works as well. With every topic exhibited, the reader can get a clear picture of your full area of expertise and dig in further. If you have a lot of articles, consider adding the total number beside each topic. Choose your topics carefully taking keywords into consideration since topic tags are recognizable by search engines. Try to stick to 25 maximum. Aside from topics, another way to maintain reader interaction is by setting up a “related” and or “popular” posts section in the sidebar or at the bottom of your articles. This can range from a plain link list, to pulling in photos and other post data to entice the visitor to click. Your article will likely appear in Google when a user has a question related to your topic. After reading your article, visitors may then have additional questions based on what they’ve learned. Through observational tracking we’ve studied on blogs, the first place readers typically turn to with questions is an on-site search feature. If you don’t already have one in your header, add search functionality to the top of your blog or within the sidebar. Pro tip: Track these searches. Talk to your developer about recording search data so you can see the exact terminology visitors are using and on which posts the searches are conducted. You can use this information to either strengthen existing content, or as ideas for future posts. B2B companies don’t have the luxury of a brick and mortar store to meet potential customers face to face, but chats and bots take us one step closer. Chats and bots tend to look the same, displaying a pop-up message generally located in the lower right corner of the screen. The best messages will ask questions in attempt to be of service to the visitor and provide the opportunity for marketers to capture them as a lead. The difference between chats and bots is in the backend functionality. Chats are set up for users to talk directly to a member of your team, so make sure there are employees who can accommodate the responsibility into their schedule. Bots are more hands-off using a configuration of predetermined questions and responses that usually end in a form of some kind or the option to book a meeting. If you are using a tile layout on the listing page, confirm that no matter where a user clicks it takes them to the post. If only the title is clickable, visitors can get what we call “click rage” from having to click multiple times to hit the target. Another listing page note is to arrange your title to be the first element visible for each article. You can either put the title above or to the left of the photo. On post pages, and throughout your site in general, use dark text. While light gray text might seem like a chic choice, it’s not very chic when a visitor gets a headache trying to decipher what you’ve written. When using hyperlinks, try to select a color that stands out from your main scheme so that when users see that one color, they always know it’s clickable. Underlining hyperlinks within articles is also a best practice. One more idea you may want to try is incorporating a brief summary at the top of each post. This is a practice commonly seen on news websites, as it’s a quick way to let the reader know what the article is about. 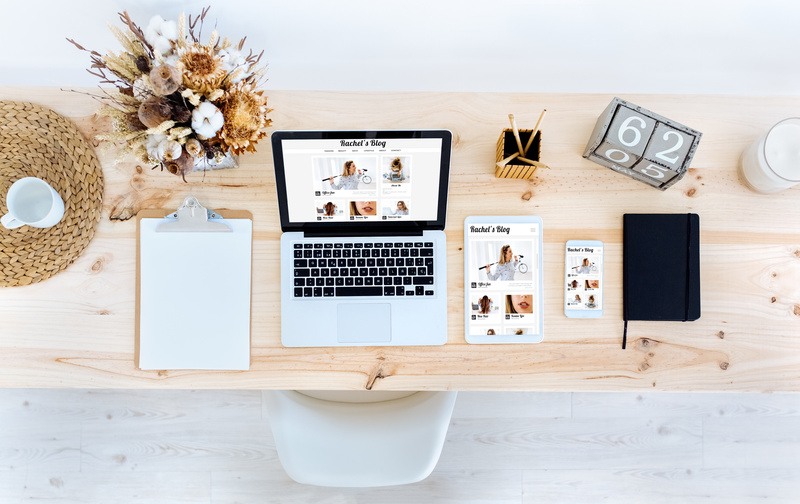 Whither you are working to vamp up an existing blog or in the process of designing a new one, incorporating these tips will help ensure your blog has everything a reader could ask for and everything your business needs to turn your blog into a marketing machine.